I recently stepped outside of my comfort zone into a new level of outdoorsiness ... foraging for wild mushrooms on the Sonoma Coast. The weekend excursion began about 90 miles north of San Francisco with a jaw-dropping journey along Highway One. This dramatic route is punctuated by frightening hairpin bends along a sheer promontory overlooking the Pacific Ocean. While holding my breath around each cliff-clinging curve, I admired the breathtaking views. It's well worth taking the drive from San Francisco to the Sonoma Coast just to experience this unspoiled seaside destination. Small farms and lush redwood forests blanket the countryside between Fort Ross and Gualala, with sensentional ocean panoramas at every turn. If you know where to go, it's also an ideal spot for mushroom hunting. The old-growth trees, salty sea air and a daily dose of coastal fog ensure a healthy environment for a myriad of edible wild mushroom varieties. Hunting for wild mushrooms has a quality similar to meditation. The task requires so much focus, it takes your mind off everything else. Gastronomically enticing yet elusive, wild mushrooms are often hidden beneath pinecones and acorns near the roots of ancient redwoods, covered by fallen leaves or obscured by patches of moss. It's a treasure hunt to find the prized varieties. To learn which species are culinary delicacies (and most importantly, edible*), you must be able to identify their specific characteristics. Winter Chanterelles are yellowish with skinny stalks and small caps, whereas Yellow Chanterelles are vibrant yellowish-orange and have gills running down the stalk. My favorite, the Black Trumpets (Black Chanterelles) resemble chocolate-colored petunia flowers with hollowed centers. Hedgehog Mushrooms feature distinctive little spikes on the underside of the caps. *Important Note: Do not pick your own wild mushrooms unless you have been trained by an expert, who has taught you how to distinguish between edible and poisonous varieties. Note: Wild chanterelles are available at farmer's markets and some grocery stores when in season. If chanterelles are not available, you can substitute store-bought cremini or button mushrooms. 1.) Prepare the tart dough: Cut the butter into small pieces. Place the flour and salt in a medium-size bowl. Use your hands to work the butter into the flour, until the mixture appears to be the consistency of pebbly sand. Form into a ball and refrigerate for at least one hour. 3.) Roll out the dough to 1/4" thick, place on a 9" tart pan or quiche dish. Blind bake the crust at 375 degrees Fahrenheit for 20 minutes. 2.) Clean the chanterelles by washing the dirt off with water. This should reveal a beautiful bright yellowish-orange color. 3.) 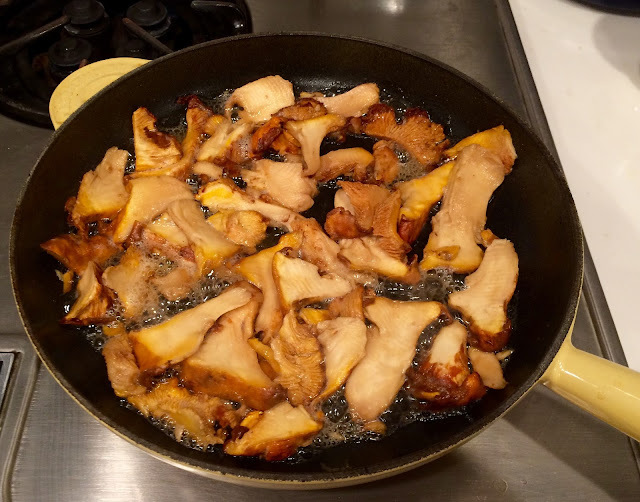 Use the "dry sauté" technique (cook on high heat with no oil or water) to cook the chanterelles. Sauté until the mushrooms have given off their liquid (about 5 to 10 minutes). The best type of cookware to use is an enameled cast-iron pan. 4.) Add the butter and sliced leeks to the pan; cook on medium heat for 3 minutes. 5.) Stir in the thyme, cream and pepper. Then turn off the heat and cool to room temperature. 6.) Spread half of the gruyère cheese over the half-baked tart crust. Next pour the mushroom-leek filling into the crust. Sprinkle the top with the remaining gruyère cheese. 7.) Bake the tart in the oven for 25 minutes or until the crust and top of the tart appear golden brown. This Chanterelle, Leek and Gruyère Tart makes an elegant meal for a dinner party or special occasion. To create an even fancier presentation, you can bake individual-size tarts, as shown in the photo below. Enjoy warm or at room temperature, and serve with fresh green vegetables or a salad. Where to stay on the Sonoma Coast? I can definitely recommend staying at St. Orres Lodge in Gualala, where I've spent the night twice and loved it. Nestled in a redwood forest overlooking the Pacific Ocean, this romantic rustic-chic lodge was inspired by the Russian heritage of the area. From its cozy entryway to the romantic dining room, the lodge features exquisite artisan craftsmanship such as beautiful stained-glass windows and detailed woodworking. St. Orres also has nine quaint, private cabins; most accommodate two guests but some have multiple bedrooms for larger parties. The Timber Cove resort in Jenner is a luxurious rustic-chic hotel (emphasis on "chic") built at the edge an ocean bluff with sweeping views of the Pacifc. I have not stayed overnight here, but I've stopped at the restaurant that has sensational views. One of my photos above was taken from the property.